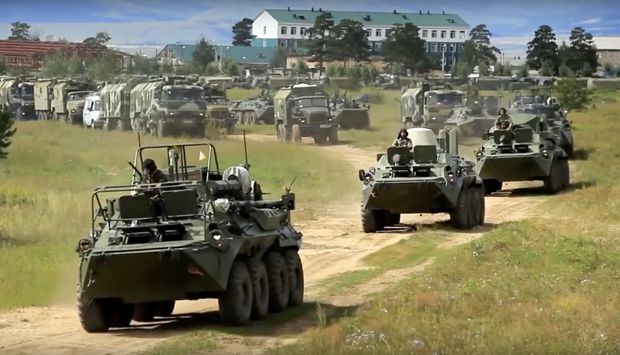 In this frame grab provided by the Russian Defense Ministry Press Service, Russian armored personnel carriers roll during military exercises in the Chita region, Eastern Siberia, during the Vostok 2018 exercises, on Sept. 11, 2018. Hundreds of thousands Russian troops swept across Siberia on Tuesday in the country’s largest ever war games also joined by China – a powerful show of burgeoning military ties between Moscow and Beijing amid their tensions with the United States. Moscow said the weeklong Vostok (East) 2018 manoeuvres will span vast expanses of Siberia and the Far East, the Arctic and the Pacific Oceans and involve nearly 300,000 Russian troops – nearly one-third of the country’s one-million-strong military. They will feature more than 1,000 aircraft, about 36,000 tanks and other military vehicles as well as 80 warships. Russian Defence Minister Sergei Shoigu has described the drills as even bigger than the country’s largest Cold War-era exercise called Zapad 1981 that put North Atlantic Treaty Organization allies on edge. A retired Russian general said that the giant war games come as a warning to the United States against increasing pressure on Russia. As the manoeuvres kicked off, Chinese President Xi Jinping visited Russia on Tuesday to attend an economic forum in Vladivostok. President Vladimir Putin treated Mr. Xi to pancakes with caviar and shots of vodka in a show of their warm rapport. Some experts pointed out that the United States helped spawn closer Russia-China military ties by labelling them strategic competitors. He noted that China feels Washington’s hostile attitude and actions, such as deploying a missile defence system in South Korea, relieve Beijing of any need to take U.S. views into consideration when deepening strategic trust with Moscow. “The war games have laid a foundation for China and Russia to enhance co-operation on international arena and will lift the combat proficiency of both sides,” he said. The Chinese media touted the Chinese involvement in the manoeuvres as the country’s largest-ever dispatch of forces abroad for war games. From China’s perspective, the emerging military alliance with Russia sends a strong signal to the United States and its ally Japan as Beijing moves to defend its interests in the South China Sea, which China claims virtually in its entirety, as well as Taiwan and the Senkaku and Diaoyu islands controlled by Japan but claimed by Beijing. Hong Kong-based commentator Song Zhongping said China is anxious to acquire more experience in large-scale operations that might become a factor in a conflict with the United States and others over territorial claims in Asia. “Russia has very strong real combat abilities and the participation of the PLA in such a large-scale military exercise that is specially tailored for an anti-invasion war indicates China’s intention to learn more valuable combat practices and lift its ability for joint combat,” Mr. Song said. For Russia, the increasingly robust alliance with China is particularly important amid the growing tensions with the United States and its allies, and a looming threat of more biting U.S. sanctions. The United States and its NATO allies are closely eyeing the exercises for what they reveal about military co-operation between Russia and China and their mounting military might.